I made that name up. I am basically just calling it what it is. Pretty boring! But don’t be fooled; these little babies are anything but boring! Easy. Delicious. Gourmet (at least to me). But not boring. Some of the kids and I were at Costco a few weeks ago, and spent a ridiculous amount of money on food. It was my first trip to Costco since moving into our new place and we were in some definite need to stock the pantry. Seriously, I got *a lot* of comments from fellow shoppers about our cart. Maybe it’s Florida?? Maybe people don’t buy as much food here?? I can hardly believe that. Either which way, others seems surprised that I had my cart full to the brim (ok, overflowing) with the goods that a wholesale warehouse has to offer. It was my first trip to a Florida Costco. My partner in crime and now Costco-loving sister-in-law was with me — yep, she’s a fan now. Lay your crackers onto a baking sheet and place on each a small slice of Brie. Or a large one, if that’s what floats your boat. Bake in the oven — I set mine at 350 — for 5 minutes, or until the cheese is warm and soft. 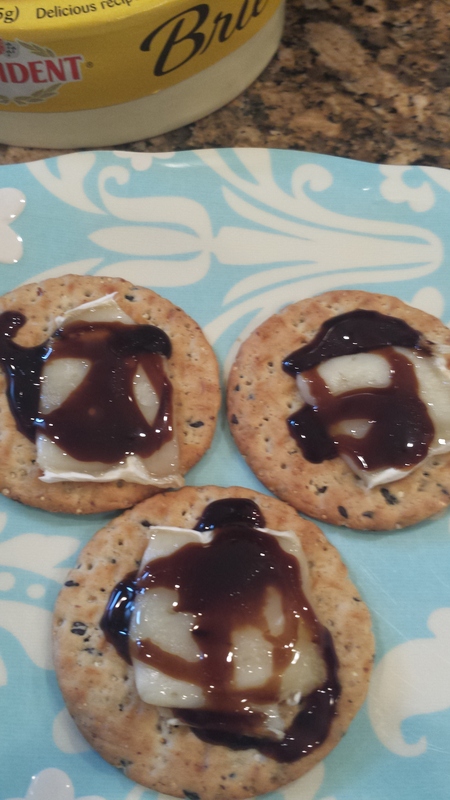 Pull out the pan and drizzle each beautiful cheese-laden cracker with the balsamic reduction. Pop one or two into your mouth. Serve a few around to those who have gathered from the delicious aroma of melted Brie. Then eat a couple more. We’ve enjoyed these as an appetizer while waiting for someone (me!) to finish cooking dinner. We’ve enjoyed them while waiting for someone (me, again) to finish preparing lunch. Actually, we’ve just enjoyed them. And we think you will, too!